Recently, I was lucky enough to play in the Gentry Invitational. Tom De Wael, who got voted in through the “End Boss” category, fell sick at the last moment. He proposed me as the replacement, so when I got the question from Niels “Gentry Overlord” Viaene to play in the invitational I was happy to play. Luckily, there was a deck I had been tinkering on for the last few weeks, and I couldn’t wait to show it off to the world. This article is about that deck. I would like to note that this is the updated version after playing the Invitational. Playing 3 rounds on camera allowed me to look back on how the games played out, which gave me some valuable insights about possible improvements. This deck is a port from the standard Simic Nexus build. The blueprint I used was the decklist from Michael Bonde, who played it to a top 8 finish at the last Mythic Invitational. Temur Nexus is a mix between combo and control. 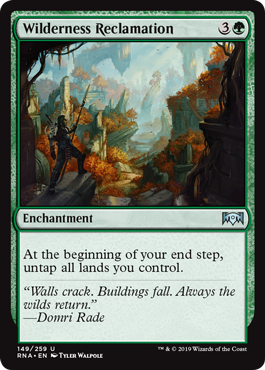 The goal is to land a Wilderness Reclamation and use the mana boost to play Nexus of Fate over and over again. Every time you loop a turn you get further ahead in your mana investment and eventually you’ll hit a point where you are 99% sure to keep finding the Nexus again. Somewhere along the road, you cast a Murmuring Mystic and win with the generated birds, or you find additional copies of Wilderness Reclamation which generate enough mana to cast a lethal Explosion. Of course, it’s not allowed to play 4 Nexus of Fate in Gentry, so you have to get a little more creative. Luckily, Invert // Invent can act as a pseudo Mystical Teachings to make sure you can find your Nexus again. 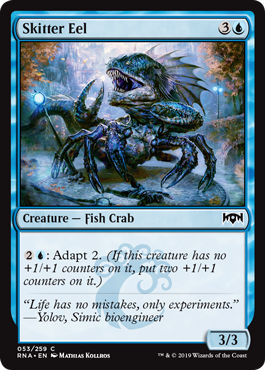 This diverts the deck from the Standard build because suddenly you need to include a third color. Having a tutor package in your deck also opens up the possibility to include silver bullets, very narrow cards that are very effective against certain opponents. To keep the deck as streamlined as possible, I chose to keep my number of bullets low, only opting to include a 1-off Recollect. Your first Invert // Invent can fetch you both Nexus of Fate and Recollect, which rebuys the Invert // Invent. Which then again allows you to find Nexus again, which then again gives you an additional turn, which….. anyway, you get the point. This deck is a ton of fun to play, but not for the faint-hearted. When you start your cycle of extra turns you’re not 100% sure to win. Like what if your Nexus and remaining Invert // Invents are in the bottom 5 of your deck? You should play like every extra turn you take is going to be your last one. Some words of advice when trying this deck out. You should goldfish it a few times first. When you start combo’ing off you’re mostly playing Solitaire for 10-20 minutes so it’s easier when you already know the usual play patterns. This will save you a lot of time in a sanctioned tournament. It’s also handy to visualize your floating mana ( and in lesser extent your amount of extra turns) with dice. Also, when you have multiple Reclamations I found it useful to tap the ones that trigger. Most of the time you’re playing some spells in between, so it’s a good way to visualize your triggers. A little side note here: my first draft of the deck included 2 Gaea’s Blessing instead of Murmuring Mystic and no Expansion // Explosion. That build was hyper streamlined and aimed to draw its whole deck and then win trough looping the 2 Blessings. Every time you played a Blessing you could shuffle some counterspells and/or Gates Ablaze back in your 1-card deck and just wear the opponent out until they got decked. Needles to say that build was a little too cute and I quickly added some actual win conditions in the form of Murmuring Mystic and Expansion // Explosion. 1) Combined with Wilderness Reclamation and Primal Amulet, this gives me a total of 7 “must-answer” cards I can drop on turn 3 after a Growth Spiral. Untapping with either of those cards increases my chances of winning dramatically. 2) I recognized early on that Mono-red and Mono-blue are really tough match-ups in game 1. Untapping with a Mystic in play should give me the edge in those matchups as they can produce enough chump-blockers while I’m executing my gameplan. 3) Coinciding with number 2, I also really like slamming it against control decks. Especially during sideboarded games where I expect they side out creature removal. 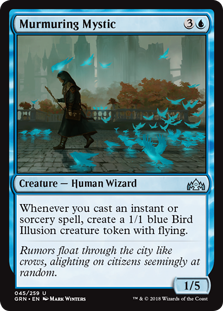 Murmuring Mystic can just run away with a game at that point. 4) The 2 Mystics used to be Hydroid Krasis and 1 Gate Colossus. But after some games I found Hydroid Krasis underpowered and Gate Colossus just didn’t come down fast enough because this version of the deck only plays 10 Guildgates. I discovered one big flaw however. Murmuring Mystic lines up really poorly against both Gate Colossus and Gatebreaker Ram. All because of the trample on the Ram and Gate Colossus’ middle line of text “Can’t be blocked by creatures with power 2 or less”. I discovered this the hard way in the finals of the Invitational, where I had to Invert my Mystic and throw it under the bus just to prevent myself from dying. This is the main engine of the deck. It’s mana-neutral the turn you cast it and every turn after that it generates enormous amounts of extra mana. I’m fairly positive that without Wilderness Reclamation this deck just would not exist. The dependency on Reclamation is also the biggest weakness of the deck. Without it the deck just operates on a normal pace and probably is a little too slow to be competitive. That’s the main reason I play Primal Amulet as one of the 4 rares. In case I don’t have a Reclamation I can play Amulet and still enact somewhat the same gameplan. Luckily the deck plays a LOT of card draw and filtering, so finding your Reclamation should not be the biggest of problems. 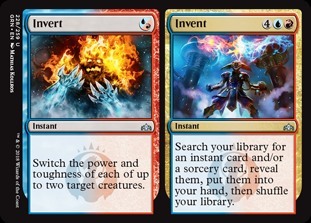 Once you’ve found it you’re definitely in the driver’s seat, as you can easily play Invent into Nexus in the same turn even though that’s a 13-mana investment. After that all your card draw spells basically turn into “ Search Nexus of Fate”. With every turn cycle, you keep dropping lands and keep casting all the card draw you have, every time your deck becomes smaller and smaller so the chances of hitting Nexus just increase over time. Finding additional copies of Reclamation and Search for Azcanta increases your chances even more. The need to find Reclamation is also the main reason why I started liking Shimmer of Possibility over Opt. Digging 4 cards deep is some nice selection and it’s a sorcery, which funnily enough is exactly what a deck with Invert // Invent wants. I said at the beginning of the article that you have to get a little creative because you simply cannot play 4 Nexus of Fate. Invert // Invent was the best thing I could come up with to make sure I find Nexus of Fate as many times as possible. And boy did this card over-perform! The ability to tutor up any instant or sorcery in your deck does warrant some sorcery speed inclusions. That’s the main reason why I went down on Opt and up on Shimmer of Possibility. Your first Invent is almost always going to fetch up both Nexus and Recollect, as you can cast said Recollect to do it all over again. Your last Invent is almost always going to fetch up Expansion // Explosion. By that time you probably have resolved multiple copies of Wilderness Reclamation and have at least one extra turn in the bank. Going to your end step and playing Explosion for X=20 is also a win condition. There are some corner cases where you might want to play the Invert side. The main uses I can think of are killing an opposing Electrostatic Field or the scenario I described above with Murmuring Mystic. I also played it on a couple of 12/4 Enigma Drakes to not die that turn. Instant-speed Explore? Sign me up! This is exactly what this type of deck needs in a card. Replacing itself and speeding up your land drops. 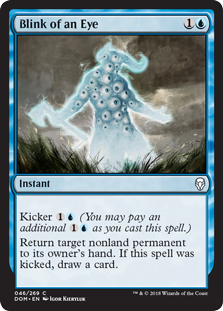 This allows me to drop Murmuring Mystic, Wilderness Reclamation or Primal Amulet a turn ahead of schedule and really put the screws on.Later in the game it’s basically a 1-mana cycle (provided you drop an additional land) which helps in executing the combo. Of course, a little raw card advantage could never hurt. Playing a Reclamation with 4 mana, untapping and playing Chemister’s Insight is a strong sequence in getting to achieve your gameplan. The deck does have some dead cards in some matchups, so it never hurts to discard a Root Snare against control decks. With jumpstart you can draw up to 4 new cards with Chemister’s Insight. In a deck that aims to find specific cards, this is about the best rate you can get. Of course, I need some interaction to protect my combo. Cancel is the most versatile and streamlined of the options but I’m liking the Devious Cover-Ups so far. It’s a strategy that started as a meme in Guilds of Ravnica Draft, but it turned out just looping your Cover-Ups was a viable strategy. This could give the Nexus deck an additional layer by shuffling some key cards back in your library. Root Snare and Invert // Invent probably being the big targets here. 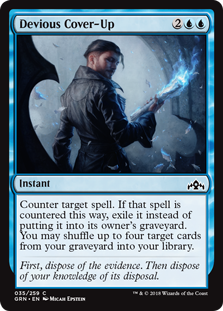 Also of note, Cover-Up exiles the card you counter, which can be backbreaking if you are playing the mirror and it’s also handy against opposing Chemister’s Insights. You could argue that Cancel is a mana cheaper, and therefore better. A statement I definitely agree with. The difference between Cancel and Counterspell is also 1 mana, but one hasn’t seen Standard play since 1999 and the other gets reprinted every 2 sets. Still, the Nexus deck can leverage it’s mana very easily, and when you play a Wilderness Reclamation on turn 4 it really doesn’t matter if you have Devious Cover-Up or Cancel up for protection. I first started the deck with 3 Cancels, but for this version, I’m stretching both ends of the spectrum by including a 2 mana-counterspell in Negate and a couple of 4 mana-counterspells in Devious Cover-Up. I figured I would want a second Negate but in extreme cases Expansion // Explosion can act as a pseudo-Negate as well. In the earlier version, I really wanted to hold on to my Expansion // Explosion but now that I can shuffle them back in my deck at any given point I’m more inclined to use Expansion for value in the early game. Resolving Wilderness Reclamation can be tricky from time to time, and I like having 2 options, both at 2-mana to allow me to push the Reclamation through with 6 mana. A few catch-all answers are exactly what this deck is looking for. If we bounce an opposing threat while drawing a card we basically time-walked ourselves. In that regard Blink of an Eye suits this deck like Remand does in modern Storm. This gives us more time to set up the combo. It’s also very good against other Wilderness Reclamation decks, as you can bounce the card before they go to their end-step. Do note that when you do that your opponent is still in his second main phase and can just cast the Reclamation again if he or she chooses to. Apart from the above, it can also protect your own Reclamation from any sort of enchantment removal. I would allmost forget that you can also name this deck “Turbo fog”. Against most aggro decks Root Snare serves as an additional Time Walk, which gives you the time to set up your combo and eventually win the game from there. If the need is really high, you can sometimes Invent for a Root Snare but I would only use that play as a last resort. 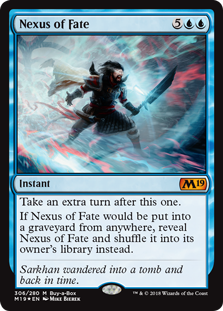 You get to dig 4 cards deep with this card, which is an insane rate if all you want to do is find either Reclamation, Invert // Invent and Nexus of Fate. The fact that this is a sorcery is surprisingly relevant because you can also tutor it up with Invent. At the Invitational, I only played 2 copies. But 3 is a better number to ensure you can get extra value from your Invents at the later stages of the game. The 1-off sorcery that’s basically a silver bullet in this deck. It can retrieve back lost copies of Wilderness Reclamation, but most of the times you are planning to Invent into this + Nexus in order to get some “free” additional turns. This should set you up far enough to chain some draw spells together in order to start going off. This card also enables some additional recycling in conjunction with the 2 Devious Cover-Ups. In the extreme case where your opponent gets rid of your 3 win conditions you can just start cycling your Cover-Ups and counter everything they play and try to grind them out that way. I’ve seen this deck getting described as a Gates deck, but it doesn’t really have any Gate pay-offs and only 10 guildgates. The red guildgates are only here to support the light splash of Invent // Invert. I’m going with 8 red sources, which feels like the ideal number. The red splash is very light and you have millions of draw spells to eventually find your red source. 12 of my 24 lands enter the battlefield tapped, which is about the highest number as I would dare go. Luckily, this deck handles tapped lands very well. Growth Spiral partially negates this drawback and with Wilderness Reclamation out your guildgates get upgraded to Taiga and Volcanic Island. This doubles as both a land and a spell, giving the deck some more consistency. At first sight, you would think this card is just win-more, but once you start looping turns with multiple Wilderness Reclamations you don’t mind trading a land for 2 new cards. The namesake card of this deck. Including this as one of your 4 rares is absolutely detrimental to the functionality of your strategy. This is the card you want to find when you start going off, as each Reclamation trigger allows you to activate Azcanta an additional time. This filters through your deck at an insane speed and it basically increases your chances of going infinite from 90% to 99%. (Still, Nexus of Fate could be your bottom card and you will lose because of that. Remember this deck ain’t for the faint-hearted) Apart from that, I don’t mind dropping Search For Azcanta on turn 2 as it will help filter my draws. This card doubles as your win-condition and an interactive card in the early game. Mainly to stave off counterspells but you could occasionally copy some cards from your opponent. Because I now play Devious Cover-Up and Recollect I’m more inclined to fire this off in the early game, as I can allways bring it back in the later stages of the game. As I’ve stated before, the deck is very reliant on Wilderness Reclamation. Adding a rare with a comparable effect increases the consistency. Once you flip the Amulet things get really messy though, can you imagine copying a Nexus of Fate? 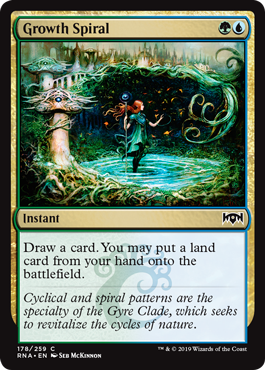 In that aspect, both sides of the card really help you cycle as many cards as possible in the quest of finding Nexus over and over again. One downside is that the Amulet doesn’t lower the mana cost of Growth Spiral and Opt. But that’s no big deal, as Opt already costs 1 mana and Growth Spiral kind of costs 1 mana. You know where this is going to. This was in the standard version of the deck and I played it at the Invitational. Digging 6 cards deep is Dig Through Time-territory but the cost of not having 4 Nexus of Fate in your deck is real. Instead I went with the extra engine card in Primal Amulet. I tinkered with this card for a little while. The theory was that it draws extra cards, can kill opposing creatures and eventually act as a win-condition. The problem was that ideally you want to drop this on turn 2, but having only 8 red sources in the deck made this too hard to do. And I didn’t want to change the mana-base. Therefore this card got the axe. Another way to rebuy your Invert // Invent or Root Snares. Overall I feel this has too little impact compared to the other possibilities. These come in against aggressive decks without much interaction, like mono-white and mono-red. Druid is an excellent blocker in those matchups and accelerates your mana too. The key in this matchup is to increase your clock and a turn 2 Druid can lead you to a turn 3 Reclamation while holding off some attackers. Just like the Druid, this card comes in against the aggressive decks. The 4 toughness on this card pushes it out of Lightning Strike and Skewer The Critics range and the surveil 2 helps you dig to your combo pieces. This comes in against other control and combo decks. Most of the time you’re cutting your Root Snares here. The classic 1-off Spell Pierce. They will never play around it, and it allows me to protect my Wilderness Reclamation on turn 5. Apart from that, leaving 1 mana open is really easy for this deck and it’s allways a good tempo play. Mono-blue tempo is a rather bad matchup, Crushing Canopy at least gives me a chance to fight their strategy. I’m mostly planning to play this at the end of their turn, they will counter it and I’ve got free reign in my turn to try and combo them or resolve a Murmuring Mystic. 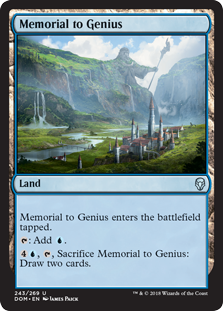 If mono-blue becomes really popular I might cut my maindeck Memorial to Genius in order to make room for some sideboarded Atzocan Archers or Kraul Harpooners. Straight from your draft decks and into your Gentry decks! I had the pleasure to have a Simic draft deck with Wilderness Reclamation and 7 cards with Adapt. I really liked the tempo you got from that and I figured there was some utility there.